This portal highlights WikiPathways content related to renal biology and disease. Most available pathways lack tissue/cell specificity and are of limited usefulness in highly differentiated organs such as the kidney. In order to produce quality renal genomics data, new and updated kidney-specific pathways are needed. The Renal Genomics Portal offers an opportunity for renal physiologists to participate in creating, testing and curating new pathways, thereby contributing with modern methodology to integrate the renal knowledge-base. Kidney Precision Medicine Project (KPMP): The KPMP actively engages academics, industry, and the broader scientific community as it works to deepen understanding of the kidneys. Epithelial System Biology Laboratory(ESBL): this webpage contains links to many relevant renal systems biology studies. Kidney System Biology Project (ESBL): this webpage contains links to renal epithelial transcriptome and proteome databases. Supported Software: a list with links and description of bioinformatics tools using WikiPathways. 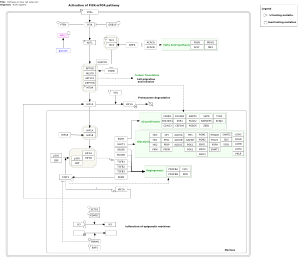 Other Pathway repositories: KEGG pathways, BioCarta Reactome. You are invited to test and curate existing pathways as well as to create new ones. All suggestions and contributions are welcome. Send general questions about WikiPathways to the wikipathways-discuss mailing list. This page was last modified on 28 September 2017, at 19:06.